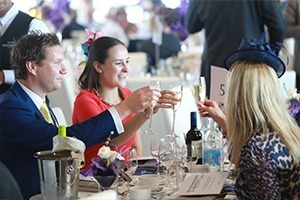 Enjoy the opening day of the Investec Derby with Epsom Ladies Day hospitality and tickets in 2019. 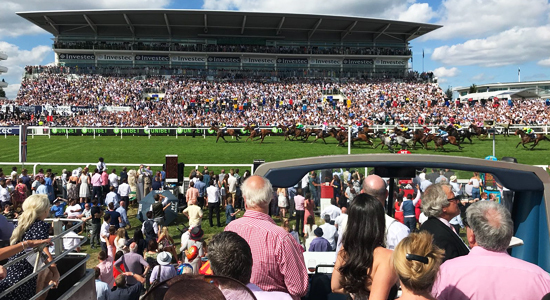 The Festival represents one of the most iconic events in horse racing, with the action spanning across two exciting days at Epsom Racecourse. Ladies Day certainly shouldn’t be missed – its fabulous fashion, style and racing provides the perfect prelude to Derby Day (Saturday 1st June 2019). Choose from a great range of Epsom Ladies Day hospitality packages, all of which can be tailored to suit to you. The Open Top Bus Experience returns in 2019. A firm favourite among racegoers, it combines some of the best views of the racecourse with complimentary drinks throughout the day and a delicious food offering. Join us for the 240th running of the Epsom Derby in 2019, and enjoy premium horse racing hospitality with our official Epsom Open Top Bus Experience. Ideally positioned at the edge of the track, this package offers a perfect elevated view of all the action in a truly unique setting. Couple this with a full range of hospitality inclusions and your trip to Britain’s richest horse race is sure to be a memorable occasion for both you and your guests. Entertain your clients in superb style on Epsom Ladies Day from your very own private balcony. The Duchess’s Stand private box not only provides fabulous first-class cuisine and service but also gives you a splendid opportunity to soak up the thrilling atmosphere and panorama of the Downs, allowing you to sit back, relax and enjoy a delightful day out with your VIP guests. Enjoy Epsom Ladies Day in an excellent fine dining suite, the Chez Roux @ Blue Riband Restaurant, situated on the first floor of the Queen’s Stand. Fantastic 4-course a la carte dining designed and delivered by Albert Roux OBE is included. Combine this with panoramic views overlooking the parade ring, winners enclosure and the winning post it is a fantastic choice for Epsom Derby hospitality. the racecourse with, quite simply, the most stunning views across the Downs. some of the finest cocktails for guests to savour. you and your client’s day with the delightful Tattenham Straight Marquee. The racecourse is just a few minutes from Epsom Town Centre on the B290 Epsom Downs Road or alternatively just off junction 9 of the M25. During the racing season, AA signs will mark all major approach routes. If you are using satellite navigation, please key in the postcode: KT18 5LQ. Alternatively, you can use the AA Route Planner and select KT18 5LQ as destination. Epsom Station is connected by both South West Trains and Southern Trains. Connections from London Waterloo & London Victoria. Take a 10 minute taxi or bus ride from the station. Please note that during The Investec Derby Festival a shuttle bus service runs from Epsom station. Approximately 1/2 mile walk to the racecourse. Approximately 1 mile walk to the racecourse. The Downs View Suite is located on the second floor of the fantastic Duchess Stand and provides a VIP experience at the Epsom Derby. My clients had a great day, the hospitality was superb and the facility provided us with brilliant views of the racing. It was such a privilege to experience this huge event in such style - the package was absolutely frst-class. We have a dedicated page where you can view, download and print all of our event information for the Epsom Derby Festival.